Sea Life Grapevine Announces Opening Of New Rain Forest Adventure Addition! You are here: Home / Dallas/Fort Worth Events / Sea Life Grapevine Announces Opening Of New Rain Forest Adventure Addition! Grapevine, Texas (June 23, 2015) – SEA LIFE Grapevine Aquarium is pleased to announce that Rainforest Adventure, its new 3,500-square-foot interactive exhibit, will open just in time for summer on Friday, July 10. The new permanent exhibit takes guests to the lush environment of the world’s rainforests where they will encounter brand new species to SEA LIFE, including caimans, piranha, pythons and more. The five-gallery display replaces the freshwater lakes exhibit and spotlights a variety of animals native to the Amazon River basin. Unique features include a piranha walk-through tunnel, a domed pop-up window in the middle of the snake habitat, and newly renovated touch tanks with coldwater invertebrates. Guests begin their journey through the rainforest where rays of light shine through the mist and forest canopy. In the Amazonian rivers gallery, freshwater fish swim amongst twisted roots, tree stumps and lush planting. The caiman exhibit takes visitors to an abandoned ancient temple reclaimed by the forest and two Cuvier’s dwarf caimans. Next, visitors of all ages get an up-close view of red-bellied piranha as they swim overhead in the eight-foot long walk through tunnel. In the snake habitat is a domed pop-up window where kids can observe the intriguing lifestyle of the Burmese python, one of the largest snake species on earth. Upon exiting the rainforest, guests will discover the newly re-imagined rock pools where they can touch and learn about coldwater invertebrates native to the west coast. Visitors can engage one-on-one with education hosts during daily educational talks to learn more about a variety of exotic reptiles including the Argentine tegu, Australian blue-tongued skink, and Madagascar tomato frog. SEA LIFE Grapevine is asking the public to help name their two Cuvier’s dwarf caimans. Cast your vote here. The winning names will be announced at the grand opening on July 10. Hours: Monday – Friday, 10 a.m. to 6:30 p.m.; Saturday, 10 a.m. to 7:30 p.m. and Sunday 11 a.m. to 5:30 p.m. – attraction remains open 90 minutes after last admission. 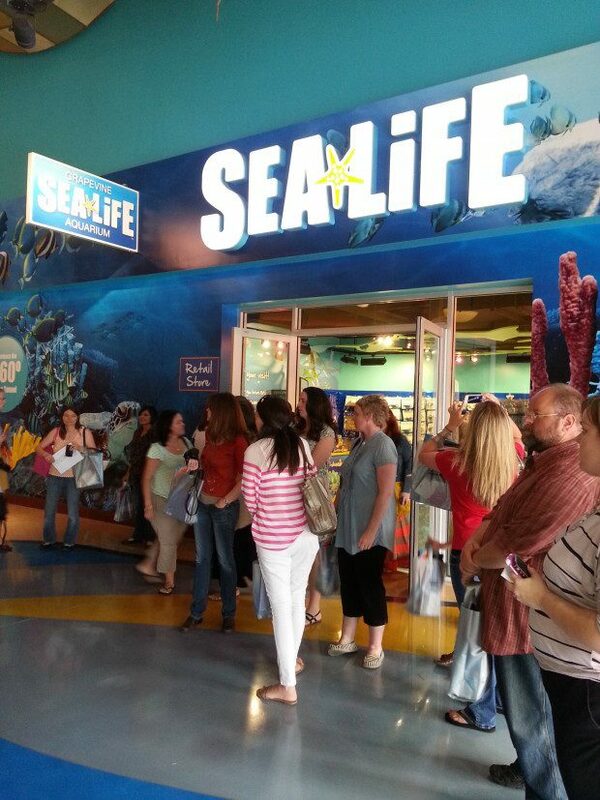 SEA LIFE Grapevine is located at 3000 Grapevine Mills Parkway, Grapevine, Texas 76051. For more information visitwww.visitsealife.com/grapevine or call 817-819-7677. Merlin has twenty five attractions and two hotels in North America – including two stunning LEGOLAND Resorts – LEGOLAND Florida with its theme park, water park and hotel; and LEGOLAND California theme park with water park and the SEA LIFE aquarium and themed hotel; Orlando Eye; Madame Tussauds celebrity wax attractions in New York; Washington DC; Las Vegas; Hollywood; Orlando and San Francisco; LEGOLAND Discovery Centers in Chicago; Dallas/Fort Worth; Kansas City Missouri; Atlanta, Georgia; Boston; Westchester, New York; Toronto, Canada; a Dungeon in San Francisco; and SEA LIFE aquariums in Phoenix, Arizona; Kansas City, Missouri; Michigan; Dallas/Fort Worth; the Mall of America in Minneapolis; Orlando, Florida and Charlotte – Concord, N Carolina – underlining the company’s position as the world’s biggest global aquarium operator. Visitwww.merlinentertainments.biz for more information.